The reproductive biology group at Florida lost one of its most devoted members in May 2017 when Alvin Warnick, professor emeritus of Animal Sciences and the first reproductive biologist at the University of Florida, died at the age of 97. With his fraternal twin, Calvin, Alvin Warnick was born November 15, 1920 on a farm in Hinckley, Utah. He attended Utah State University and graduated in June 1942 with a degree in Animal Husbandry. He joined the Army Air Corps in Salt Lake City. He was one of the first radar technicians in the military, receiving training in both the U.S. and England before being assigned to the 100th Bomb Group in the 8th Air Force during combat missions from 1943 to 1945. While training at Truax Field in Madison, Warnick met with Professor Lester Casida of the Dept. of Genetics at the University of Wisconsin. Casida offered him a fellowship to be taken up upon peacetime. After the war, Warnick returned to Wisconsin to study with Casida, earning a MS in 1947 and a PhD in 1950. He also met and married his life-long love, Barbara Webster from Oshkosh, WI. After graduation, Warnick served on the faculty at Oregon State University for three years and then took a position at the University of Florida in 1953. During his 37-year career at Florida, he authored or co-authored four books and published over 350 research papers, either as sole or joint author. He also did sabbatical research in Argentina for the Food and Agriculture Organization of the United Nations in 1962-63, and further research in Brazil in 1977 and Ethiopia in 1986. Dr. Warnick supervised 70 MS and PhD students. He also served for 20 years as Assistant Chairman of the Animal Science Department at the University of Florida. Warnick brought modern reproductive management to the Florida beef cattle industry. He was the first person to palpate cows for reproductive diagnoses in the state of Florida. He evaluated effects of crossbreeding, level of nutrition, and many other factors and led efforts to incorporate artificial insemination and embryo transfer into cattle management schemes. He is probably best known for his work characterizing reproductive function of Bos indicus cattle. 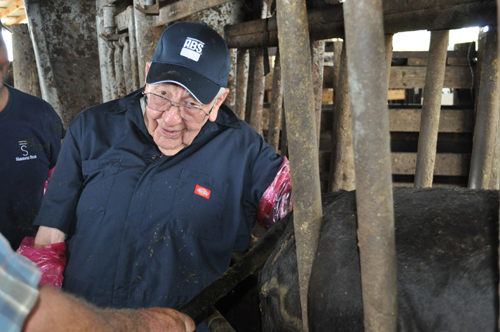 After retirement in 1990, Warnick continued as an active contributor and participant at beef cattle workshops throughout Florida (he was palpating cows into his 90s), taught reproductive physiology at the UF College of Veterinary Medicine and participated in international conferences in Canada, Brazil, Australia, Sweden and Hungary. Warnick was elected a Fellow in the American Society of Animal Science (1984), was honored by Utah State University in 2004 and was inducted into the Florida Agricultural Hall of Fame in 2015. The Warnick Lecture Series sponsored by the Dept. of Animal Sciences was instituted to recognize his accomplishments.